Evangelist Billy Graham passed away this morning at his home in Montreat, North Carolina from natural causes, according to a family spokesperson. He was 99. Graham was known and beloved worldwide for his evangelistic crusades. He also was the founder of the Billy Graham Evangelistic Association which consists of resources for growing your faith as well as answers Graham gave to readers’ questions, and much more. “Blessed are those who die in the Lord...that they may rest from their labors, and their works follow them” (Revelation 14:13). According to the Huffington Post, at 16 Graham was converted after attending revival meetings. He went on to be ordained in 1939. He married Ruth McCue Bell in 1943. They had six children together, two of which are the also well-known Rev. Franklin Graham and Anne Graham Lotz, the founder of AnGeL Ministries. Graham’s influence extended across the globe, and his evangelistic crusades and gospel preaching brought him into contact with many world leaders and influencers, including multiple American presidents, Martin Luther King Jr., and Queen Elizabeth II. He was truly one of the most influential people, and certainly Christians, of all time. But that platform all started with his personal decision of faith, and throughout his career, this is what he preached--a relationship with Jesus. As you ponder Graham’s death today, we pray you will consider your own faith and hopefully be encouraged and inspired by Graham’s conviction about the truth of the gospel. 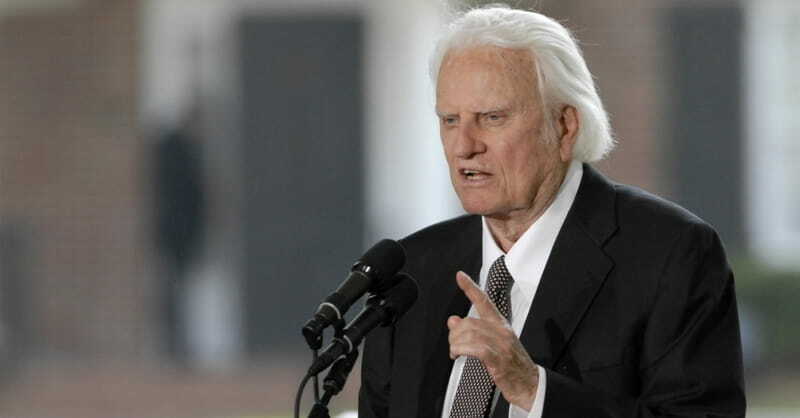 Editor’s note: Be sure to read ChristianHeadlines.com’s other content on Billy Graham today, including a response piece from Christian leaders. Photo: Evangelist Billy Graham addresses the audience from the stage during the Billy Graham Library Dedication Service on May 31, 2007 in Charlotte, North Carolina. Approximately 1500 guests, including former U.S. Presidents Jimmy Carter, George H.W. Bush and Bill Clinton, attended the private dedication ceremony for the library, which chronicles the life and teachings of Graham.